Click for the Newer Version of this Bat. We have spent over a hundred hours of cage and game time experience among several different players to formulate our 2017 Combat MAXUM Review. This, combined with our 2016 review, should get you on the right path if you’re looking at pulling the trigger. Our extensive experience, both in game and in cage with the Combat MAXUM, suggests the 2017 Combat MAXUM is best for hitters looking for the absolute most barrel size per… Jump to the full review. We aren’t the only ones to have information about the Maxum. Other places, in particular those who sell bats, usually have a boiler plate write up on the specs of a bat. Many of those we reference to make sure we are seeing what we should be. Here are some more references for the 2017 Combat Maxum review. Our extensive experience, both in game and in cage with the Combat MAXUM, suggests the 2017 Combat MAXUM is best for hitters looking for the absolute most barrel size per swing weight. The barrel’s physical size, the bat’s defining feature, is unrivaled in the market. While the MAXUM’s total barrel size is first in class, we were not convinced its max performance area is any larger than other top shelf performance bats. But, we do think the Combat competes for the top spot in best performance bat. We would heartily recommend the 2017 Combat MAXUM for the player who (1) has the budget, (2) wants the biggest physical barrel per swing weight and (3) understands that power in a one piece design comes at the express consent of occasionally losing feeling in your thumbs on mishits. We would also recommend the drop 5, drop 8 and drop 10 before the drop 11 and drop 12 as the lighter sizes tend to exaggerate the hand ringing and lack the gumption to compensate. We would also recommend looking for the 2016 version of the MAXUM as there were not many changes in the design and, can often be found for less. There are virtually no changes to the 2017 Combat MAXUM when compared to the 2016 version aside from the change in color design. This approach is not uncommon for many bat companies, so nothing to be up in arms about. They simply manufacture so many bats based on their expected sales volume for a given year, and then revamp the design for the following year and reprint. If a buyer is smart, they'd look for the 2016 version of the MAXUM while it can still be found in wrapper. Soon enough, probably by early 2017, we will see the prices equalize. There is a whole list of things I think about when the word Canada comes to mind. It will depend on who you ask, but some would say there are no comparable bats to the 2016 or 2017 Combat MAXUM. It is, they would argue, in a class of its own. Indeed, at least to some extent, we can agree. It is a massively sized single piece composite bat with an array of sizes with an ultra light swing weight. No other bat or bat company delivers that degree of single piece composite sticks. But Combat isn’t alone in the space. Similar designs, at least in some of the sizes, can be found in the Dirty South War and Dirty South Swag bats. The War and Swag are built, we’d guess, with the Combat line in mind. They may lack the sizing options to be considered a true competitor, but they are clearly making a run. Another in the single piece composite space is the Louisville Slugger Catalyst—although it lacks the barrel size to be considered the same level of performance. Cage work and a few games with the BBCOR 2018 Combat MAXUM, as well as a couple conversations with major vendors on the bat, put us in a spot to publish a review. After discussing with several players that have used the BBCOR Dirty South KAMO and measuring its exit speeds and swing weights, we write this review. New for 2019 Mizuno has released a huge barrel on a single piece composite bat. We spent a lot of time, with a half dozen other hitters, hitting the 2019 Mizuno Power Carbon to write this review. When we were first to review the Maxum in 2016, it created quite a stir. The revolutionary enormous barrel size put other name brand bats to shame—or so was the claim. We, at first, were skeptical thinking the side by side pictures were a bit fuzzy. But, after some real live testing and measuring on our part, turns out the claims were legit. If anything, they were understated. The barrel is flat out yuuuge. And the single piece design with the white barrel makes it only look more yuuuuuge. We’ve seen the Combat MAXUM in action for probably a hundred at bats. Add that to the near hundred hours in the cage among several different hitters and we are sure we have a pretty good feel for the bat. On the whole, the players who succeed with the MAXUM are base hitter types who bat in the 2 through 5 hole. Every so often we would observe a towering bomb from the Maxum, but more often than not, we saw a legit hard ground ball or a rope to the gap for a stand up double. Like most, we were enamored with the MAXUM’s barrel the first time we saw that boat oar on our front porch. It is no doubt a sight to behold, making other top shelf bats look like they’ve been on a 72 hour cleanse: all thin and dehydrated. The balloon of a barrel on the MAXUM is also remarkably light to swing and its ultralight one piece composite, when hit dead on the sweet spot, makes for an easier bat flip as you begin your trot around the bases. 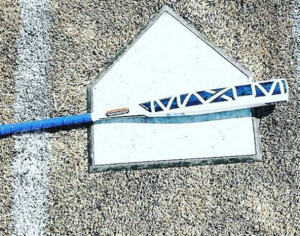 If it’s a single piece composite bat you want with a light swing that defines the term ‘oversized barrel’ we dare say you’ve found your bat. We have long heralded Combat’s firm commitment to perfecting the single piece composite stick with an ultra light swing weight (MOI). The design, in theory, delivers the absolute most power directly to the ball and then amplifies it through the use of a well worked in composite. in practice, Combat has done more than any other company to match the theory. The 2017 Combat MAXUM is the latest in Combat’s quest. The bat is a single piece composite bat formed into the largest barrel on the market. Durability, which may have been a concern three or four years ago in the full composite space, has been designed out of the equation with more reliable construction and Combat’s industry-exclusive 500 day (one time replacement) warranty.